The exhibition [as if] by Andrea van der Straeten, first presented at the Landesgalerie Linz, groups together existing works as well as new productions. The overall project of exhibition and catalogue with the title [as if] proves to be the most comprehensive overview to date dealing with the artist's oeuvre. Her art work since the 1980s has been concerned with films, installations, drawings, photographs and objects which are located at various points on the interfaces of the different mediums. 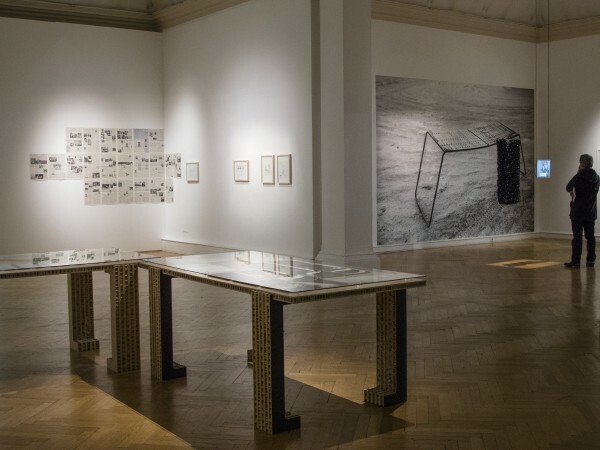 The artist repeatedly pursues her concepts as a systemic interventions and in so doing analyses mediums such as film and photography along with processes, procedures and the functional connections in art itself. One key notion in many of her completed projects is "information". What is true, what is only a rumour or even fake? What information and meaning is inscribed in things, objects and their depictions? How does communication about their contents function? How can this be decoded? Which words are used, which language? A second key notion is the "reference". Van der Straeten repeatedly pursues her concept for a work by referring to a story, which becomes manifest at particular points in history. The referential space here is defined as a broad spectrum that includes women's and gender issues, biographical moments and political events as well as local and literary sources, and extends to the history of art and institutions. This referencing and artistic re-working of reference material takes the form of deconstructing history as a fixed narrative form. The artist proves to employ a particular precision in her choice of subject matter in this field and be sensitive to connections and contexts. Andrea van der Straeten conceived of the two exhibitions—in Linz and Luxembourg—as a sequence of rooms in which she interlaces works from different contexts of origin. This results in a special parcours-without any claim to being a retrospective-that covers van der Straeten's work to date. She has, however, added something special, developing a project for each of the two locations involved. For Linz she realised the video installation [as if]; for Luxembourg the work Abend Land Morgen Rot and, in addition, there is Die Familie der Bilder which links the two institutions.